Have you ever thought to yourself that you wanted to hire a mini-me for your business? You might have even said it out loud. I know I have said this before so I could have someone to do all the work. It is hard for any leader to hire someone like you that will treat your business like you do. likely want your people to take more responsibility. Today we look at going beyond responsibility. In fact, the gap between responsibility and ownership is huge. I studied the top of the mountain, the Inc. 5000. You guys are familiar with this list? They put it out every year. But it’s 5000 of the fastest-growing private companies in America. And it’s based on consistent growth, so it’s over a three-year period. To put this in perspective, let’s look at the data. The average company is gonna be in somewhere between that five and 40%. And I know what you’re thinking, “40% over three years wouldn’t be so bad, would it?” But the people I interviewed, the CEOs of those Inc. 5000, 51 of them, the average growth is 2700% plus.That three-year period showed consistency. And it showed leadership. I had a chance to sit down with them, in these one-on-one sessions, this wasn’t all done by survey and kind of a faceless thing. A lot of it was virtual, but I just talked to them about their sales and their marketing and their leadership and their culture. Really fascinating information and it really was… It got me excited about what I was uncovering. There was one question in there though that I thought was really powerful. It was this one. Oh, I know what you’re thinking, 2700%? Over-achievers, right? Sorry, I missed the joke. Sometimes that happens. This one question was the real benefit of the research I did. With big growth goals, how do you get your employees motivated to take responsibility for those goals? It’s a good question, right? How do get them to take responsibility for those goals? After I talked with these leaders, it became clear. They corrected me in my thinking. It wasn’t about responsibility. It was about ownership. That’s one reason why I opened up with a little story about your first car and your rental car. You can see the gap between responsibility in ownership there, right? Very clear. And your workforce, do you want your employees to have responsibility or do you want them to have ownership? I think I know the answer. When I started talking to them about this, it was really cool to uncover ownership is this way to lead in which people feel like owners. Now, that’s just a little bit of an excerpt from a speech I recently gave. Now I talk to people all the time about leadership and culture and hyper-growth. My name’s Gene Hammett, I travel around the world talking to companies about growth, about hyper growth specifically and what they need to understand about how to make this happen within their own teams. Now, this whole sense of ownership really does explain what companies are doing to grow fast. Let me give you some context to this. I have sat down with them, with the Inc. 5000, the fastest growing companies and I talk to their CEOs. The first iteration of this, I did 51 interviews with hyper-growth companies. On average they were growing 2700% plus over a three year period. Now I know that’s a huge number and you may not even be able to think about that because your company’s so big or maybe your company’s growing in similar pace. Either way, when I talked to these leaders about this aspect of ownership, it came from one question which wasn’t really about ownership. It was with your high growth goals, how do get employees to take responsibility for those goals? I thought it was a good question. And I talk about this question all the time in my speeches because that was the one question that really opened up a new conversation. Because these leaders corrected me. It wasn’t about responsibility. It was about ownership. Now I share this with you because hyper-growth companies want people to feel like owners. They want them to feel like what they do is contributing to the overall company. They want them to feel like their work matters. They want them to feel like they are little entrepreneurs inside a bigger cosmic or bigger organization if you will. Now all of this is about feeling like owners. Imagine for a second that you have people showing up to work where they think of it as their company. That the project that they’re working on has to produce value for the overall organization and they’ve got to be resourceful, they can’t just waste time, they can’t spend extra money, they’ve got to do it with an entrepreneur’s approach to this. Much like you did when you first did when you started the business. Now I say all this with a smile because you’re probably going, I wish I could have more people like me, I wish I could have more mini-me’s running around here. And this is the concept. If you could figure out how to create more of a feeling of ownership, you would have employees doing that over and over. Now how do you create this sense of ownership? Well, I’ve got a report that I’ve made available to people, I’m gonna make it available to you if you want to go ahead and download it, it’s genehammett.com/hypergrowth. It is my research with those 51 original companies. Now since then, I’ve talked to over 50 more and I’m doing one or two every day since then because that’s what I do. 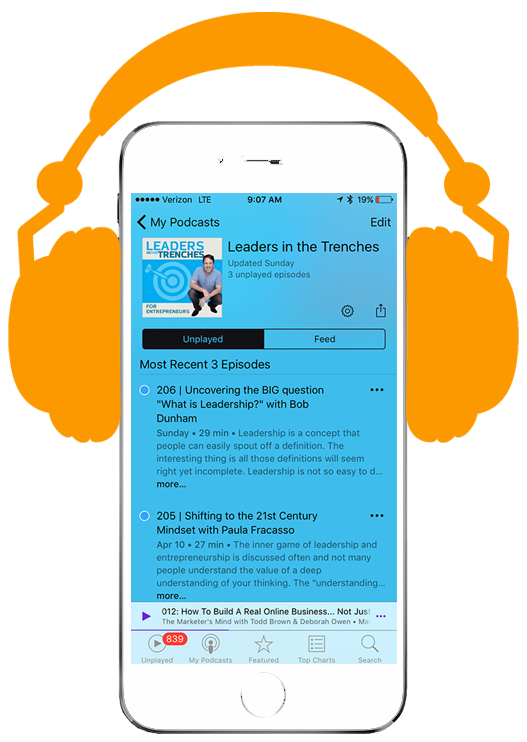 Writing for Inc. magazine, creating this podcast, creating all of the stuff I create around leadership and culture requires me to stay on the forefront of growth and leadership. Now I share this with you because if you want to download that report, it’s absolutely free, just go to genehammett.com/hypergrowth and you can find out exactly the six disciplines of hyper-growth companies. Alright, my name’s Gene Hammett, I share all this with you to help you become a better leader and to be more confident in exactly who you need to be to create hyper growth and active the people inside your company. Alright, that’s my take. Here as always, lead with courage, and I’ll see you next time.